Environmental law addresses the most important challenges for humanity and the planet in the 21st century. The study of environmental law requires interdisciplinary approaches, including consideration of aesthetics, ecology, economics, politics, and more, in order to understand the context of governing human environmental behaviour. Going beyond traditional doctrinal analysis, I have devoted my career to pioneering a more ambitious conversation about the philosophical and theoretical dimensions of environmental law, with a particular focus on time, aesthetics and ethics in environmental governance. Through this framework, I have researched a wide variety of issues, including Indigenous peoples and environmental management, ethical investing, corporate social responsibility, time in social and ecological systems, and most recently the role of aesthetics and the arts in environmental behaviour and law. Apart from my academic endeavours, I belong to several community-based environmental organisations, and practice eco-stewardship in my own Tasmanian bush retreat,'Blue Mountain View'—66 acres of high biodiversity land that I have protected forever with a conservation covenant. In this sanctuary and other places I have been involved in some citizen science projects monitoring local biodiversity. A representative summary of my research highlights is detailed with the following abstracts of my books. Ecological restoration is as essential as sustainable development for the health of the biosphere. Restoration however has been a low priority of most countries' environmental laws, which tend to focus narrowly on rehabilitation of small, discrete sites, rather than the more ambitious recovery of entire ecosystems and landscapes. 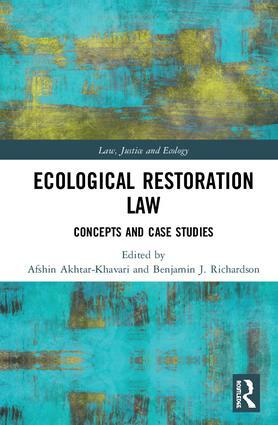 Through critical theoretical perspectives and topical cases studies, this book's diverse contributors explore a more ambitious agenda for ecological restoration law. Not only do they investigate current laws and other governance mechanisms, they consider the philosophical and methodological bases for the law to take ecological restoration more seriously. Through exploration of themes relating to time, space, geography, semiotics, social justice, and scientific knowledge, the book offers innovative and critical insights into ecological restoration law. Disciplined by industrial clock time, modern life distances people from nature’s biorhythms such as its ecological, evolutionary, and climatic processes. The law is complicit in numerous ways. It compresses time through ‘fast-track’ legislation and accelerated resource exploitation. It suffers from temporal inertia, such as ‘grandfathering’ existing activities that limits the law’s responsiveness to changing circumstances. Insouciance about past ecological damage, and neglect of its restoration, are equally serious temporal flaws: we cannot live sustainably while Earth remains degraded and unrepaired. 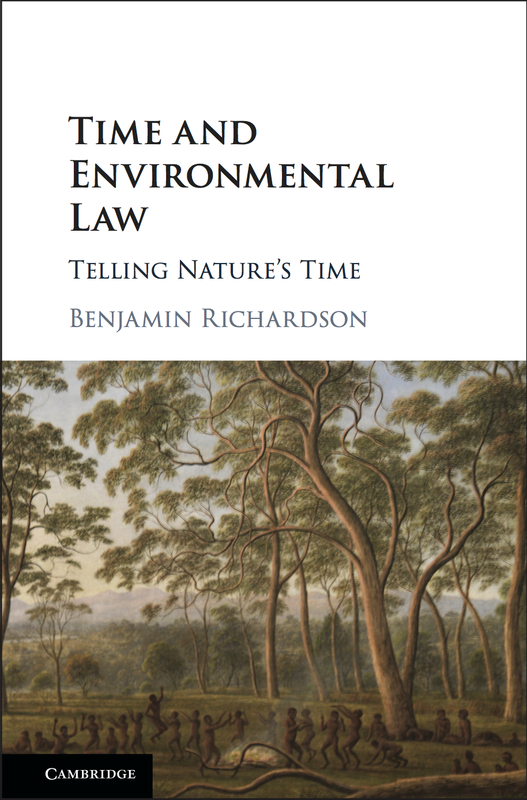 Applying international and interdisciplinary perspectives of these issues, Time and Environmental Law explores how to align law with the ecological ‘timescape’ and enable humankind to ‘tell nature’s time’. 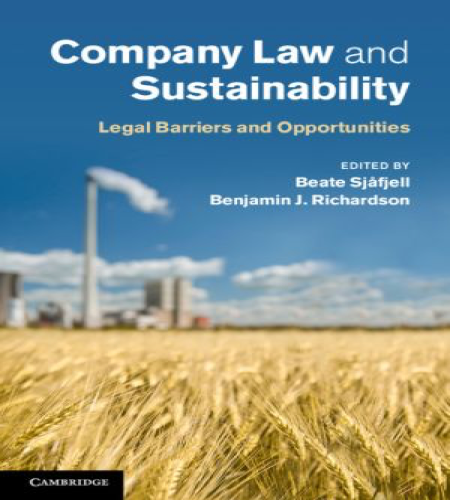 This investigation of the barriers to and opportunities for promoting environmental sustainability in company law provides an in-depth comparative analysis of company law regimes across the world. The social norm of shareholder primacy is the greatest barrier preventing progress, and it also helps explain why voluntary action by companies and investors is insufficient. By deconstructing the myth that shareholder primacy has a legal basis and challenging the economic postulates on which mainstream corporate governance debate is based, Company Law and Sustainability reveals a large unexplored potential within current company law for businesses to reorient themselves towards sustainability. 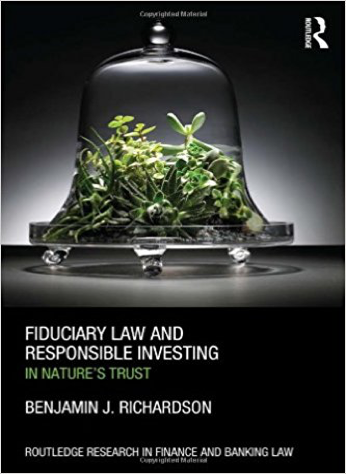 This book assesses fiduciary law’s influence on the financial economy’s environmental performance, focusing on how the law affects responsible investing and considering possible legal reforms to shift financial markets closer towards sustainability. Written for a diverse audience, not just legal scholars, the book examines in a multi-jurisdictional context an array of philosophical, institutional and economic issues that have shaped the movement for responsible investing and its legal framework. While the fiduciary prejudice against responsible investing has waned in recent years, owing mainly to reinterpretations of fiduciary and trust law, significant barriers remain. This book advances the notion of ‘nature’s trust’ to metaphorically signal how fiduciary responsibility should accommodate society’s dependence on long-term environmental well-being. This timely book examines the legal and policy challenges in international, regional and national settings, faced by developing countries in mitigating and adapting to climate change. With contributions from over 20 international scholars from developing and developed countries, the book tackles both long-standing concerns and current controversies. It considers the positions of developing countries in the negotiation of a new international legal regime to replace the Kyoto Protocol and canvasses various domestic issues, including implementation of CDM projects, governance of adaptation measures and regulation of the biofuels industry. Derived from papers given at a workshop, Local Climate Change Law examines the role of local government, especially within cities, in addressing climate change through legal, policy, planning and other tools. 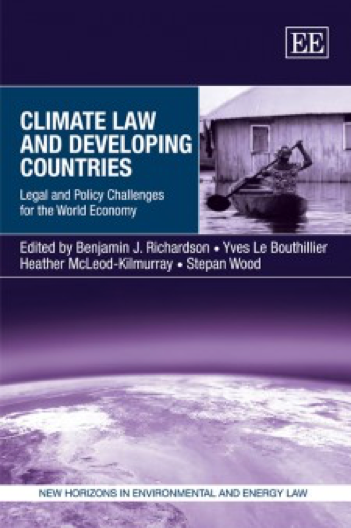 This edited volume offers a multi-jurisdictional perspective, featuring international contributors who examine both theoretical and practical dimensions of how localities are addressing climate mitigation and adaptation in Australia, Canada, China, Europe, South Africa and the United States, as well as considering the place of localities in global climate law agreements and transnational networks. Overall, the book highlights that local governments can make a useful contribution to fighting global warming in an era where national governments are often reluctant to act. 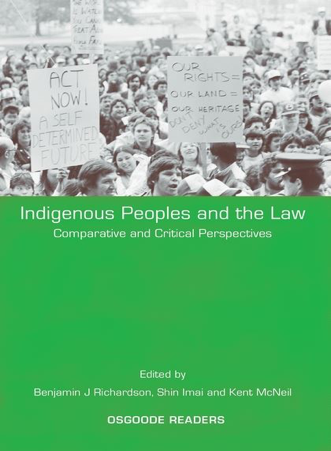 This book provides an historical, comparative and contextual analysis of various legal and policy issues affecting Indigenous peoples. It focuses on the common law jurisdictions of Australia, Canada, New Zealand and the United States, as well as relevant international law developments. The edited collection of new essays features 13 contributors including many Indigenous scholars, drawn from around the world. The book provides a pithy overview of the subject-matter, enabling readers to appreciate the seminal issues, precedents and international legal trends of most concern to Indigenous peoples. Environmental harm is commonly associated with the front-line companies that most visibly consume and pollute our shared natural resources. Rarely are the “unseen polluters”, the financial institutions that fund eco-damaging corporations, put at the forefront of the environmental debate. 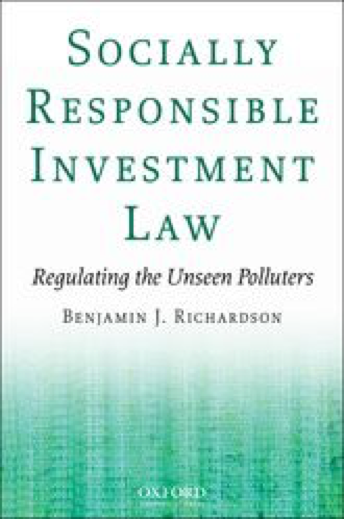 By focusing on these unseen polluters, this book examines the response of the movement for socially responsible investment (SRI) and its current regulation worldwide. In offering a guide to possible reform to ensure ethically-based investments, this book proposes greater regulatory supervision of SRI. This volume of essays presents critical scholarship on law for sustainable development. 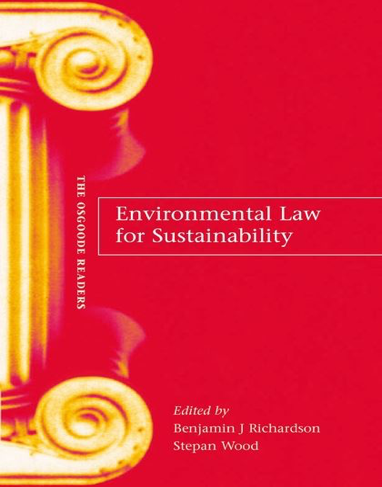 Its contributors provide international and comparative perspectives on the current state of environmental law and its future directions. The book goes beyond conventional descriptions of environmental law and policy to a theoretical and interdisciplinary analysis of the role of law in sustainable development. 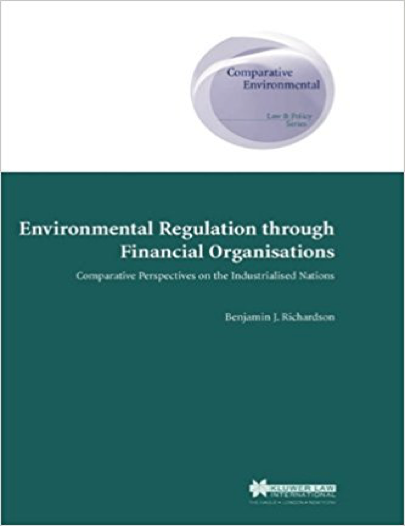 In particular, the book explores: future directions in command regulation; changing forms of public administration; risk assessment and precautionary regulation; ecological justice; public participation in environmental decision-making; indigenous peoples and the environment; industry self-regulation; economic instruments; sustainable finance; and the state of international environmental law. This work takes a comparative perspective of practice in the European Union, North America, Japan and Australasia, arguing that existing legal reforms to promote sustainable development are unlikely to succeed unless environmental policy is embedded in the financial services sector. It shows how this sector plays a crucial role in creating the financial conditions that allow much economic development to proceed. Financial markets are already highly regulated for various public policy objectives, and there is scope to adapt existing regulation to incorporate environmental aspects into the financial sector. Beyond this sector, the book raises complex questions regarding the relationship between the state and market i in environmental policy. This edited volume examines obstacles to environmental justice in neo-liberal economic systems founded upon deregulation, privatization and the preference for market mechanisms. The book explores definitions and policy dimensions of environmental justice and market mechanisms. It is the first to investigate the link between these two approaches, measuring market-based tools of environmental law such as tradable permits against the requirements of environmental justice. The book concludes with a call to transcend the dichotomy between regulation and the market, and advocates a `new deal', a combined effort of the state and the market in which environmental justice provides the overall normative framework. Professor Benjamin J. Richardson is a scholar of environmental law who researches across interdisciplinary studies in addressing philosophical and theoretical issues. He holds a professorial appointment with the UTAS Faculty of Law and the Institute for Marine and Antarctic Studies. In 2017 he also held the Global Law Visiting Chair, at Tilburg University in the Netherlands. 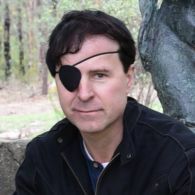 After completing his undergraduate studies in law and political science at Macquarie University and his PhD at the Australian National University, Professor Richardson worked abroad for nearly two decades in law faculties in New Zealand, Canada and the United Kingdom. Prior to joining UTAS in July 2014, Professor Richardson was at the University of British Columbia where he held the Canada Research Chair in Environmental Law and Sustainability and was Director of the Centre for Law and the Environment. Earlier, he held academic appointments at law faculties at York University (Canada), University of Manchester, and the University of Auckland. Prior to working in academia, Professor Richardson had stints in policy and consultancy roles for the NSW National Parks and Wildlife Service in Sydney and the IUCN (International Union for Conservation of Nature) in Kathmandu and Nairobi. Please see Professor Richardson's full CV (PDF 356.4KB). Professor Richardson's significant experience in contributing to collegiate life within the university has been associated with his extensive record of university-based administrative roles, including academic program directing, committee chairing, academic standards setting and event organising. Among specific areas of responsibility, he has had considerable experience in student admissions decision-making, managing postgraduate programs in law, and participating in human research ethics approvals. Professor Richardson has 25 years experience as a teacher of environmental law and many other subjects. His teaching has covered most facets of domestic and international environmental law, including climate change law and marine law. His other teaching expertise includes Aboriginal legal issues, corporate social responsibility, legal philosophy and property law. Professor Richardson's teaching and scholarship is diverse, including climate change law, socially responsible investment, corporate social responsibility, and Aboriginal legal issues. Global recognition of Professor Richardson's work includes earning the Research Excellence Prize of the UN Principles for Responsible Investment Academic Network (in 2010) and the Senior Scholar Prize of the IUCN Academy of Environmental Law (in 2012). His teaching has also been recognised, as co-recipient of the 2007 Outstanding Program Award in international Education from the Canadian Bureau of International Education. His teaching initiatives include launching the Global Environmental and Resources Law Externship Program, the first such clinical education program offered in Canada. Environmental law including climate change law, biodiversity law, marine law. Major current research focuses on the relationship between time and environmental governance, of which a subset is research governance of past losses and eco-restoration. Other research expertise includes long-standing work on the legal dimensions of socially responsible investment (SRI) and corporate social responsibility (CSR). This research focuses on the legality of SRI, the capacity of SRI to be a means of governance in its own right, and how the legal system can facilitate SRI. The research on CSR considers how company law might be reoriented to improve the environmental practices of business corporations. Professor Richardson's research dovetails closely with the core research themes of UTAS. As a scholar and teacher of environmental law, he analyses the influence of legal institutions on environmental decision-making and considers how the law may be reformed to promote sustainability. Over the past decade he has concentrated on the interface between business law and environmental law, and how sustainability can be incorporated into legislation governing corporations, financial markets and other dimensions of the business sector. Professor Richardson has also devoted many years to studying the movement for socially responsible investing as a means of disciplining the market. Social investors were active in the campaign to stop the Gunns Pulp Mill, which was stalled when the ANZ Bank declined to loan the money necessary to undertake the project. Social investing has similarities to corporate social responsibility, another focus of his research. Business corporations may voluntarily commit to improve their environmental performance, as evident by adherence to codes of environmental conduct, issuance of sustainability reports and investment in innovative environmental services and products. In recent years Professor Richardson's research has taken a more philosophical orientation with an investigation of the role of time in environmental decision-making. 'Time' can yield rich insights into why environmental law has not been particularly successful and how it might be improved. The problematic temporal properties of environmental law include its stance towards the past, the future, the pace of time, and the timing of decisions. For example, environmental law can suffer from temporal amnesia as the lessons of environmental history are sometimes ignored or trivialized, resulting in past mistakes – such as pollution disasters – being repeated. Conversely, the interests of posterity and long-term biosphere health can be belittled through glib rhetoric (eg 'intergenerational equity') without serious efforts to curb enduring environmental impacts such as soaring carbon emissions. Other temporal shortcomings may include poorly timed decisions, as evident in hurried environmental assessments to fast-track dubious developments, or procrastination on introduction of protective measures such as reducing greenhouse gas emissions. These temporal flaws also reveal apparent tensions between nature's temporal patterns and the time frames of law and other social systems. For example, arguments about the 'optimal' rate of exploitation of natural resources (eg forests or fish stocks) to satisfy human economic needs competes with a slower time frame for ecological regeneration and renewal. These and other aspects of time are the focus of Professor Richardson's work that is leading towards a major book. Professor Richardson's published scholarship focuses on environmental law, with significant cognate work on aboriginal legal issues and business law (finance & corporate law). In particular, her has pioneered scholarly insights on the intersection between environmental law and the financial sector, especially the governance of socially responsible investing. Among his edited and authored nine books, are Company Law and Sustainability (Cambridge University Press, 2015, with Beate Sjafjell), Socially Responsible Investment Law: Regulating the Unseen Polluters (Oxford University Press, 2008) and Fiduciary Law and Responsible Investing: In Nature's Trust (Routledge, 2013). 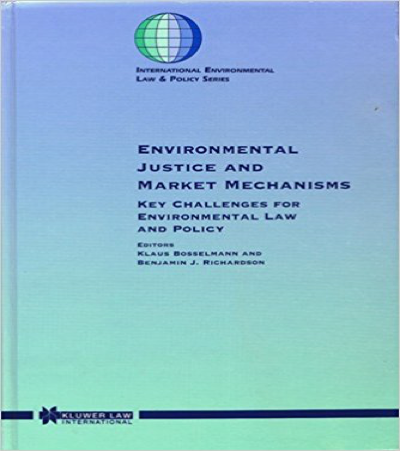 They build on his research on economic tools for environmental law, reflected in the books Environmental Regulation through Financial Organisations (Kluwer, 2002) and the co-edited volume Environmental Justice & Market Mechanisms (Kluwer, 1999). 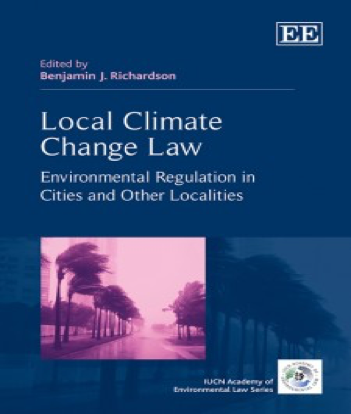 On climate change law, Professor Richardson edited Local Climate Change Law (Edward Elgar, 2012) and Climate Law in Developing Countries (Edward Elgar, 2009). He has also published on environmental law's impact on sustainability, notably co-editing / authoring Environmental Law for Sustainability (Hart Publishing, 1996, with Stepan Wood). Aboriginal law is another of part of his diverse research interests, and her co-authored the report, Regional Agreements for Indigenous Lands and Cultures in Canada (ANU Press, 1995, with ben Boer and Donna Craig) and co-edited / authored the book Indigenous Peoples and the Law (Hart Publishing, 2009 with Shin Imai and Kent McNeil). Professor Richardson's academic career has been facilitated by generous research funding over many years. Prior to joining UTAS, he was awarded in Canada three SSHRC (Social Sciences and Humanities Research Council) personal grants, which are equivalent to the Australian Research Council's Discovery Grants: C$110,146 (2014), C$97,827 (2009) and C$94,679 (2005). This research funding has been directed to work on socially responsible investment governance. In 2010, he was awarded from the same body a C$1.4 million Canada Research Chair in the area of environmental law. Also, Professor Richardson has been a participant in some major collaborative grants: Kr 5.8 million from the Research Council of Norway and C$2.1 million from SSHRC for the Canadian Business Ethics Research Network and a further C$1 million from SSHRC for the Responsible Investing Initiative. He has also raised several grants for organising conferences and related outreach activities, including C$40,000 from Canadian donors and NZ$44,000 from the New Zealand Law Foundation. Professor Richardson has also had success raising funding for teaching initiatives, including approximately C$25,000 to launch the Global Environmental and Resources Law Externship Program. The project aims to improve academic knowledge and practical knowhow in developing a richer and moresocially inclusive framework for engaging communities in nature conservation through aesthetics, includingthe arts, and thereby to generate recommendations for nongovernmental organisations and governmentpolicymakers working on environmental issues. This will be achieved through a community workshop, fieldCALHothouseResearchEnhancementProgramEOI2017Page5of12trip to a nature reserve, engagement with stakeholders especially school teachers, and scholarlypublications.Aesthetics is vital for engaging communities in their natural environments because it can generate anemotional and cultural commitment in a way that science and economics cannot easily solicit. However, theappeal to environmental aesthetics has tended to exalt landscapes that are pristine, without people, andto use imagery or messages that appeal primarily to specific socio-economic groups (eg, the well educated,affluent, and urban) while of less relevance to others, such as poorer, rural populations, disaffected youth,and sometimes Aboriginal communities.Because Australian society is deeply divided in how it values landscapes, we urgently need a moreinclusive and varied approach to reading aesthetic values in the environment (eg spiritual and historicvalues, and recreational benefits, in addition to ecological values). If environmental law and policy, and thepractices of environmental organisations, are to achieve broader community support, a more sophisticatedframework for assessing aesthetic values is needed to underpin environmental decisions.The project (in the UTAS-funded phase) collaborates closely with the Tasmanian Land Conservancy (TLC),the leading private land conserver in the state, to investigate how these challenges can be met through acase study of its Five Rivers Reserve in the central highlands. A community workshop and site-visit overtwo-days will involve academics, artists and local stakeholders to identify and evaluate a process forunderstanding environmental aesthetics, and to extrapolate how this can inform the work of organisationssuch as the TLC and government regulators such as the Department of Primary Industries, Parks, Waterand Environment (DPIPWE).Thereafter, the project with external funding would be scaled up to include additional community-focusedcase studies in Tasmania and one mainland state, and partnering with a community nature conservationorganisation in that mainland state in order to develop a more comprehensive framework of relevance toother stakeholders across Australia. The project looks at the application of a terrestrial cultural business model to the marine environment and evaluates opportunities for indigenous engagement in marine activities. The project also develops indigenous research capactity. A workshop and accompanying research paper that examines eco-restoration in Australia and the development of more scientifically-informed governance and policy. Professor Richardson has many years of experience supervising Master and PhD students in an exceptionally wide variety of subjects. These include all dimensions of environmental law, as well as aspects of Aboriginal law, international law, business law, and refugee and human rights law. For instance, his current PhD supervisions include two Canadian students from the University of British Columbia who are researching corporate social responsibility and transnational peace parks. Professor Richardson is also often asked to participate as an examiner of graduate theses completed at other universities in Australia and abroad. He particularly welcomes opportunities to supervise research legal issues relating to socially responsible investment, eco-restoration, and the role of 'time' in environmental decision-making.